Who does not love happy surprises? Especially children! The joy we see in their eyes, when they open festive stockings or boxes gift wrapped is unmatched. Their innocence and eagerness to find out what Santa Claus has brought for them is something we do not want to miss! All over the world people celebrate Christmas by giving gifts to each other. In fact, Christmas itself is a gift given to the mankind by God. The preparations for the festivities begin way ahead of time, we wonder about baking special cakes, pies and our favorite foods. Where as for a few who also exist in our society, festivities may not be the way in which one would imagine. Children whose parents are incarcerated do not get to enjoy Christmas the way we do. “When you focus on being a blessing, God makes sure that you are always in abundance” Here is an opportunity to fill a poor child’s Christmas stockings with special gifts, which will help them believe that life is not all bad. These gifts can help them gain their confidence and understand that the society is helping them in staying strong through their tough times. 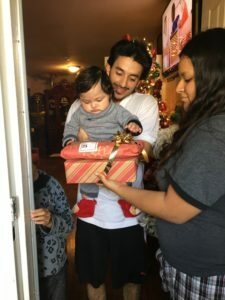 Angel Tree Christmas, a program of Prison Fellowship, reaches out to children of prisoners to help them connect with the love of Christ. This program helps you be that angel for these children and help them meet their emotional, physical and spiritual needs. Lauren’s House and and community partners like Facebook and Family Giving Tree, have partnered with us for years, helping the community blossom.